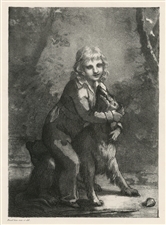 Pierre Paul Prud'hon original lithograph "L'enfant et chien"
Medium: original lithograph. Catalogue reference: Beraldi 3. Executed in 1822; this impression on cream wove paper was printed in Paris by Bertauts and published in 1869 by Gazette des Beaux Arts. The image measures 8 x 5 3/4 inches (202 x 145 mm). Not signed. Condition: there is a tear to the right edge of the sheet, not affecting the image (see the second photo).